In November 2012 I bought my horse Wayamo (Waikiki I from Weltmeyer x Disco-Tänzer), a Württemberg gelding who is now ten years old. Unfortunately Wayamo was underweight with an uneven distribution of muscle when I bought him. His hooves were the most worrisome problem because they were in an alarming state: various misalignments, poor horn quality and very thin soles. I soon managed to improve my horse’s weight problem and his coat and mane shone brightly again. After a while he had built up his muscles too. All in all he was in reasonable condition if it weren’t for his hooves. Despite feeding each and every supplement from a variety of manufacturers over the years his problems didn’t really decrease. He still had brittle hooves, kept losing his shoes and developed sores and other hoof ulcerations. His hooves didn´t grow well so that the misalignments could not be compensated. My veterinarian and farrier took it in turns with regular visits to t reat his frequently occurring lameness. In early 2016 a new farrier who came to alter the shoeing of my horse, one more time introduced a different approach. Even though the positioning of the hooves had significantly improved, my horse was barely able to stand in the stable aisle during shoeing without his shoes. The hoof substance was still very poor. My farrier suggested a consultation with Karen Zetsche from Life Data Labs. During this extensive talk she recommended feeding "Farrier’s Formula Double Concentrate“ as a hoof supplement in addition to oats and hay. Ms. Zetsche also suggested my horse probably suffered from the so called white line disease and recommended that I should also treat the hooves with " Farrier’s Finish“ and from now on dismiss all other hoof oils and greases. I have been feeding the product for about five months now and apply "Farrier’s Finish“ almost daily. After a short period of time my farrier and I were able to see the improvement of the entire hoof structure–the horn began to grow faster, the hoof gained stability and even under extremely wet conditions the hooves would crack just minimally at the lower margin. Up to now no new inflammations have occurred and my horse is free from lameness. Of course it will take a few more months before the hoof quality of my horse has been completely restored. Since his hooves are basically still growing at a slower rate than average it will take at least a year to complete new hoof growth with this feeding regime of Farrier´s Formula. It also became evident that six months or more prior to feeding " Farrier’s Formula“ Wayamo must have suffered from internal bleeding in his widened white line, probably even a minor surge of laminitis. After repeated consultations with Ms. Zetsche I know now that my gelding is perfectly adjusted diet-wise and I won’t have to change anything. I feel competently advised and I can see steady improvements in my horse’s hoof condition. As I mentioned before there were no more occurrences of lameness and my horse lost a shoe only once. The diet has also had a positive influence on Wayamo’s physical fitness; he is more motivated and more powerful. My vet confirmed his good health. 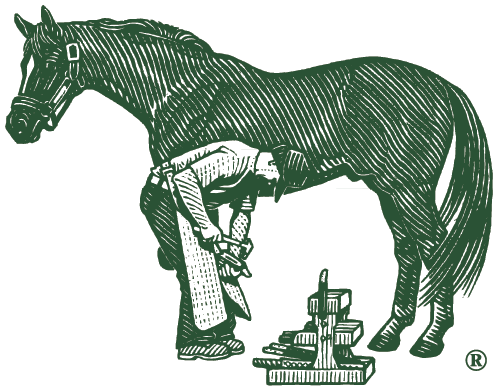 For all these reasons this feed Farrier´s Formula – as well as "Farrier’s Finish“ – are for me significantly distinct from all comparable products currently on the market. It is the only feed supplement that was able to help my horse. Therefore I have no hesitation in highly recommending these products. Image 1 and 2 - Shortly after acquiring Wayamo in December 2012. Front hooves flat, tilted, uneven, with poor horn and sole quality. Hind hooves; worn down with strong abrasion, frequent loss of shoes and inexplicable lameness. After five months of feeding "Farrier’s Formula Double Concentrate“ + Treatment with "Farrier’s Finish“, July 2016 (New hoof growth on both front and hind legs clearly visible. Just in the lower third of the hooves some crumbling horn can still be seen, but even there however I already notice the effect that Wayamo is not lame anymore, and has "good healthy” horn regrowth. There is just minimal cracking around the nails. Already no more loss of shoes and we are already seeing a more motivated horse. This is us nowadays, having fun together– and no more lameness!